Overcast skies and 10 percent chance of rain, after months of drought conditions…. A generous tradition started by David Hodgkins. 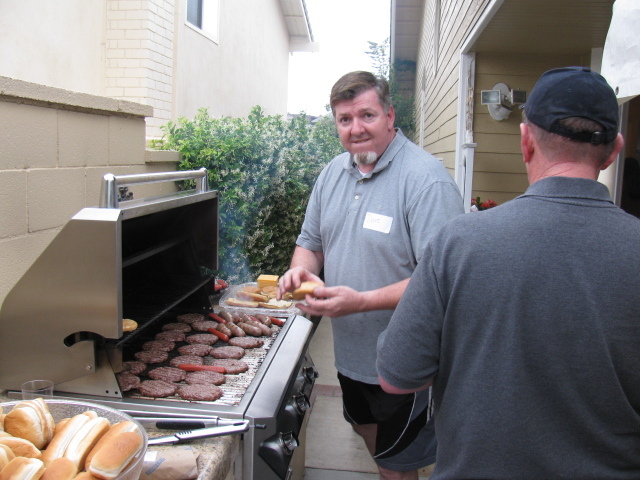 Here is our host at the BBQ, working hard to feed all of the guests. I met one of the Car Warriors builders from the East Coast Team, Mark Stackler. Another guest at the Pre-Party was Scott Merrell of Coupe Connection. He talked about the 8-stack induction system fitted on a Ford Coyote engine. Very interesting, and I may use that engine in my next project car. More gray skies, but no mention in the forecast of rain. As usual for me, my focus was to gather as much info about Coupes as possible, so I can apply these ideas into my car project. 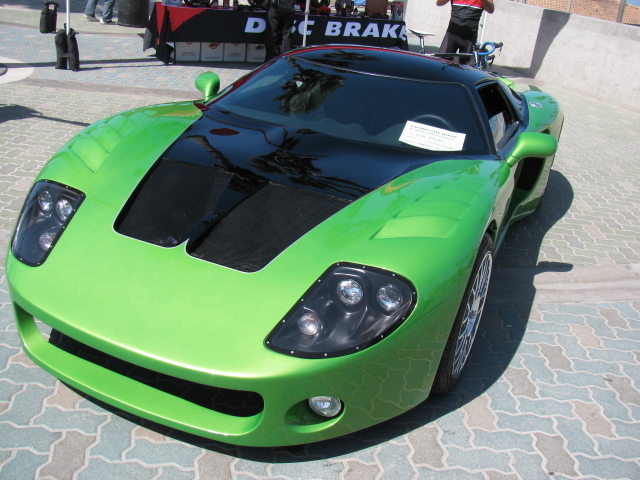 Also as usual, I had to look at all the other Factory Five Racing kit cars on display. I noticed more completed 33 Hot Rods this year and more Coupes. I met and discussed body and paint with Jeff “Da Bat” Miller in the early morning. 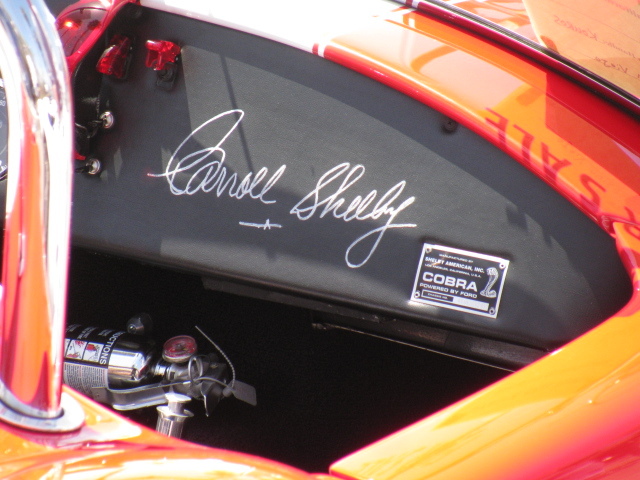 He has probably put the final finish on hundreds of Factory Five Racing cars over the years. 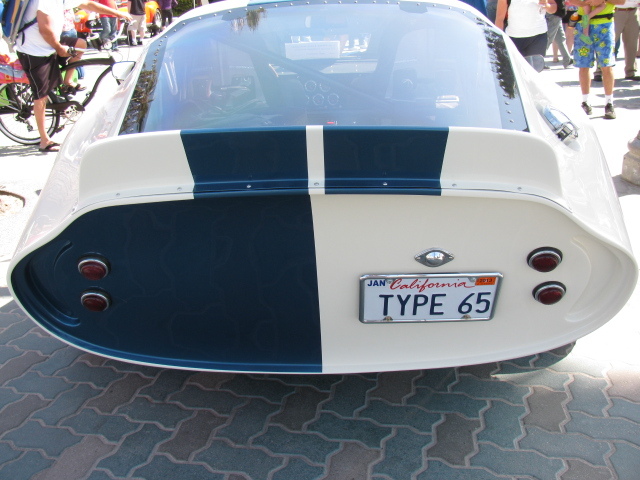 Da Bat was the Body and Paint expert for the West Coast team on the Car Warriors Factory Five Hot Rod challenge. I was lucky to meet and hang out with Karen Salvaggio and Jo Coddington as we visited with the builders and the cars on display. Karen and Jo were two members of the five lady team on the “All Girls Build” episode on Power Nation. The other ladies were Nan Gelhard, Cherielynn Westrich and Courtnie Provencher. Here’s a picture of Karen on the left with Jo on the right. And that’s Sue from Just Get Dirty Garage in the middle. Sally Bean, one of the behind the scenes people from Factory Five, is in the background, making sure things are going as planned….. Factory Five Racing president Dave Smith introduces Jo Coddington to the crowd. 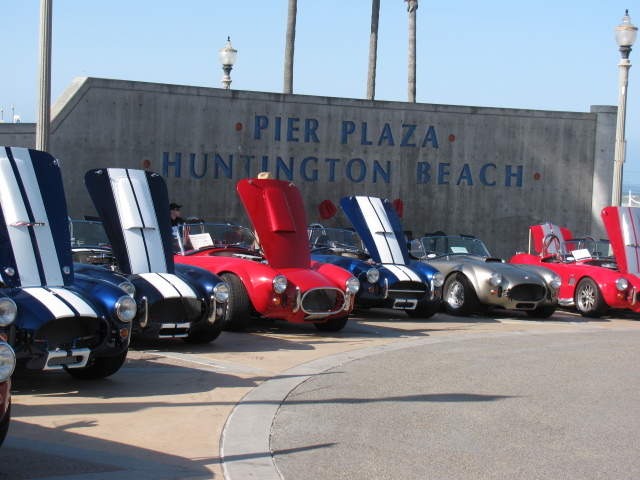 Peter Brock, the body designer of the Daytona Coupe, came to Huntington Beach for this event. I have several of Peter’s historical posters on my walls, but I wanted to meet him in person. Peter is a nice guy, and he truly loves the Factory Five Racing version of the famous Ferrari-killer from 1965. 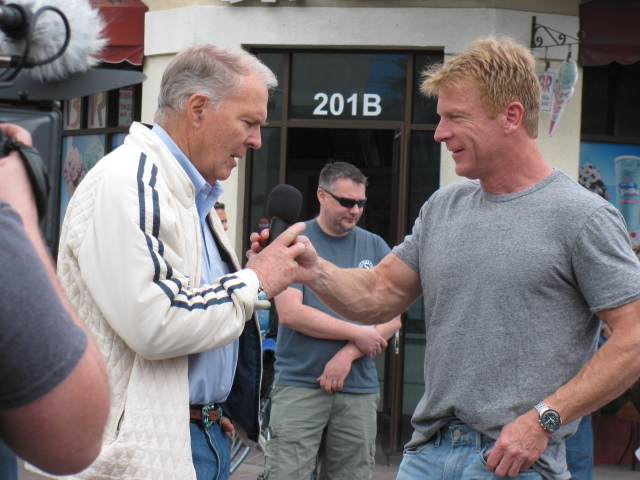 Factory Five Racing president Dave Smith (right) introducing Peter Brock to the Cruise-In crowd. There’s Mark Stackler in the background. On display was the SoFast Racing Factory Five Racing Type 65 Coupe. 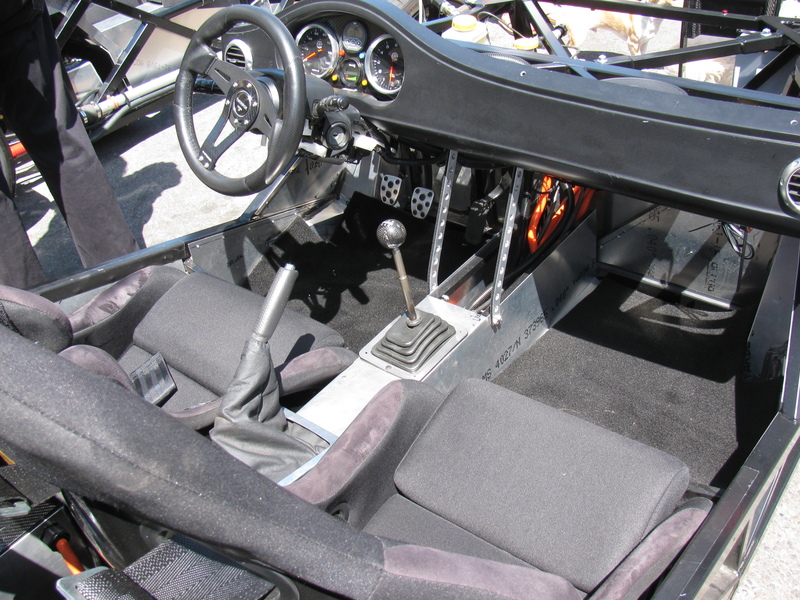 This kit car holds a land speed record at the Bonneville Salt Flats. Allen Grant was there to sign autographs and display the car. The fastest Factory Five Racing Type 65 Coupe and land speed record holder. I made a few “walk around” videos with my new GoPro Hero 3. The footage is raw and needs some editing. I will post some after I do some editing. Just as the event was ending, it started to rain. It was only a few minutes, but it managed to get stuff wet. I guess we can call it a California rainstorm. The local weather reports did not report any rainfall…. Here are some more pictures of this great annual event. Someday my Coupe will be there, too! 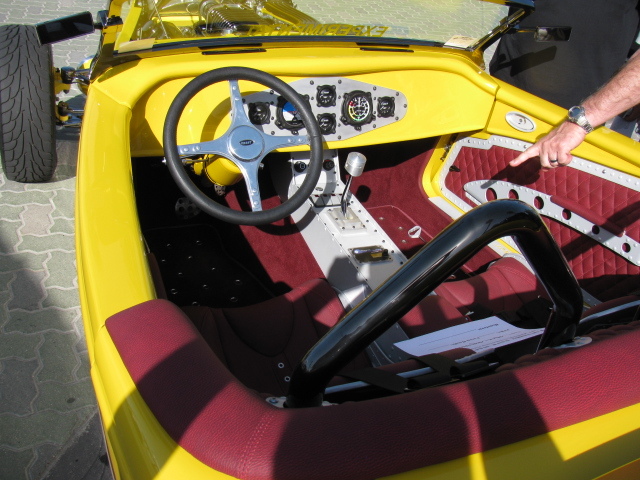 The lead photo for this entry is Erik Hansen’ electric 818 cockpit. It is in “go kart” stage (a work in-progress), without a body. 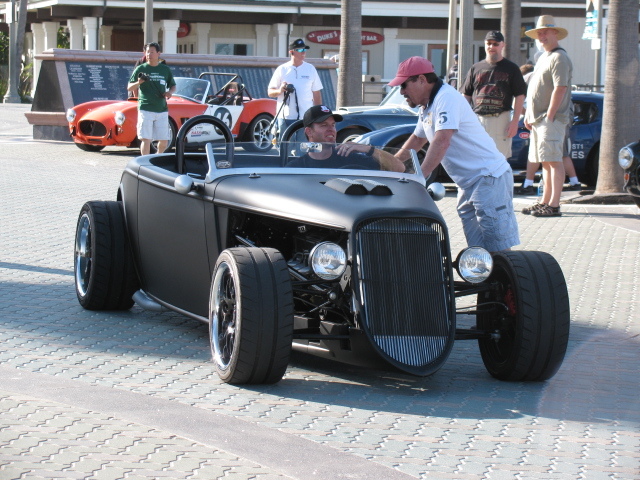 Click here to read Erik’s Electric 818 build blog. I spent most of the day at the 7th Annual Factory Five Cruise-In. It was great to see some of the builder/owners from the previous year, and I also met a lot of builders for the first time. 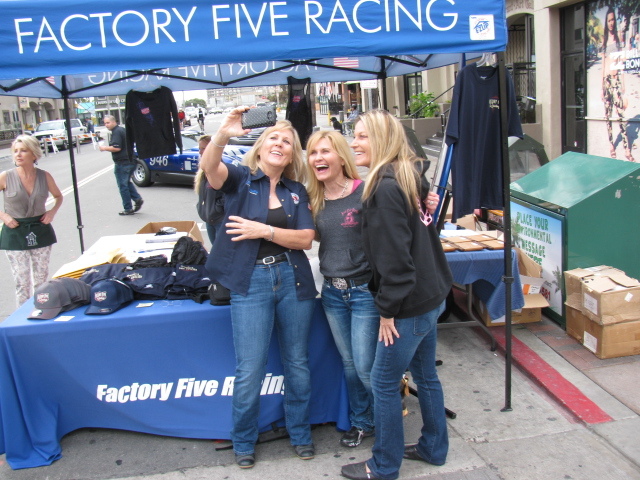 I even met several of the Factory Five staff, including Scott “Honey Badger” Bell; Jim Schenck, Director of R and D; Tony Zullo, Tech Manager; and Sally Bean, Marketing at Factory Five, who does a ton of work behind the scenes of these great get-togethers. First, an “All-Women 427 Build Team” Factory Five Racing Roadster. The ladies built the car in one week. The build story will be on PowerNation’s “Detroit Muscle” TV in May. Second, a special, limited edition Hot Rod magazine ’33 Hot Rod. Only 33 of these will be made, and for the first time, Factory Five will be selling the 33 ‘33s as fully-built cars. 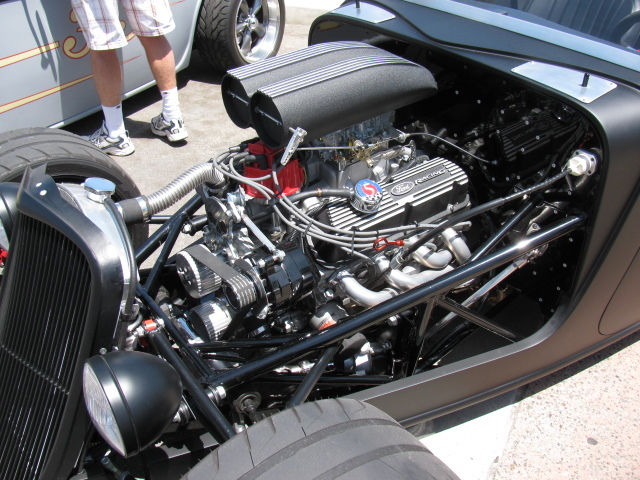 Two engines will be offered, a monster Ford engine, shown here, and a Chevy engine. I do not recall the details, but I will post them here as an update as soon as I can verify the information. This year, I planned to gather as much information and pictures on the Type 65 Coupe, since I am always looking for ideas to include in my car. 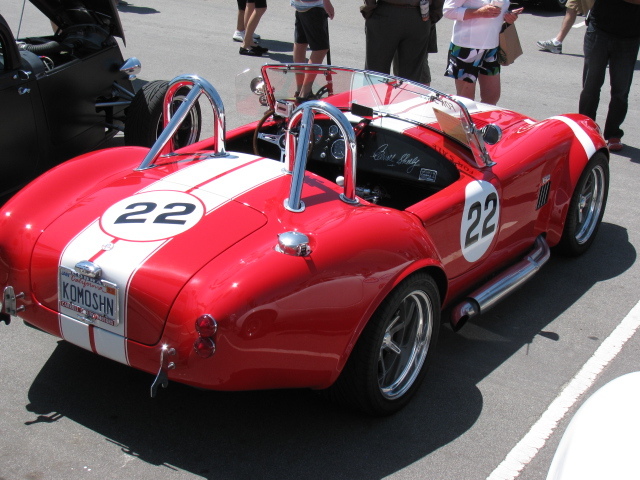 But – with so many beautiful Roadsters on display, I had to look at those closely, too. Here are some random images from the great car show! 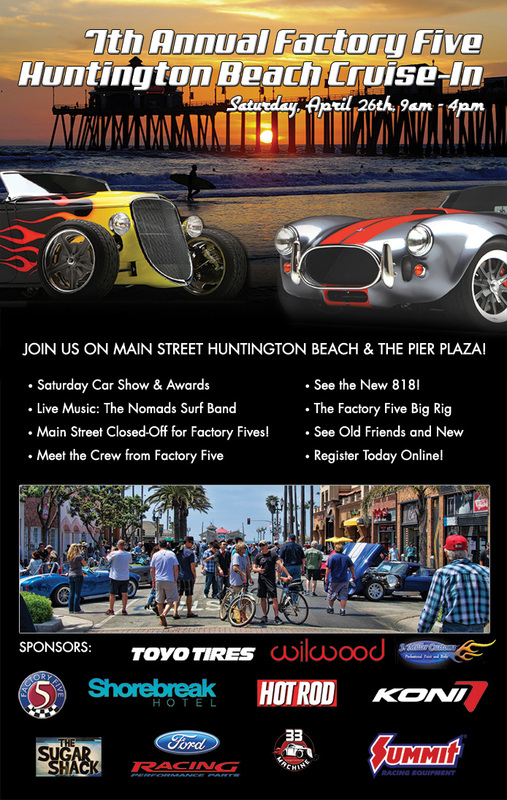 The Factory Five Racing Cruise-In at Huntington Beach is expanded to include both Pier Plaza and Main Street this year. 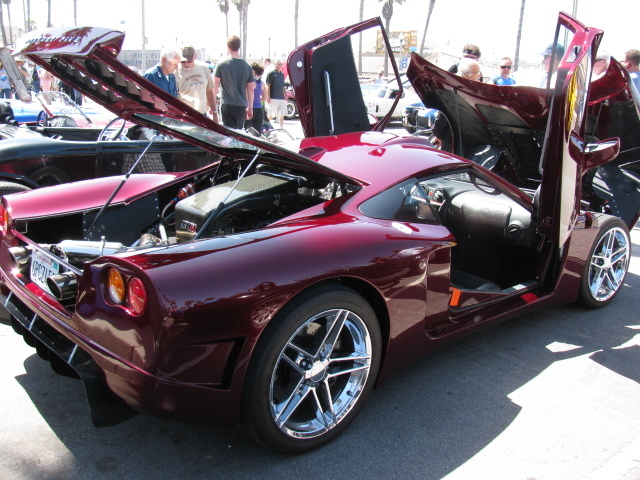 On top of all this, a tour of the Riverside Auto Museum and an autocross event is scheduled for Sunday, April 28. 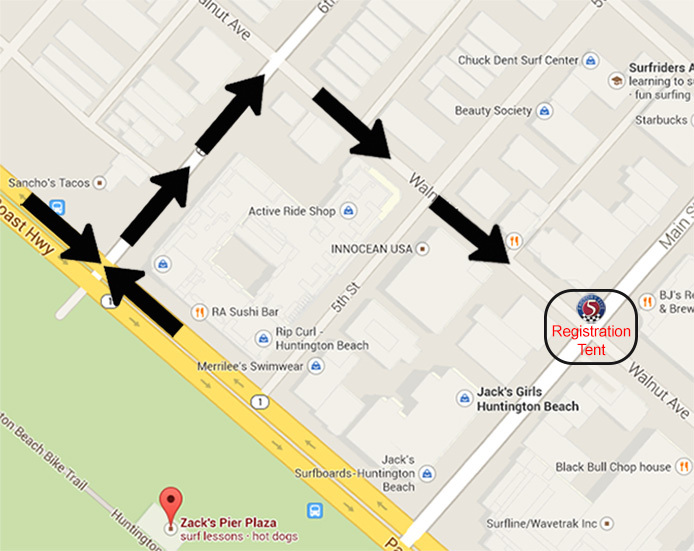 The event is free and open to the public, an entry fee is charged for Factory Five Racing car display space. Click here for more information on the 2013 event. Click here for a quick video of last year’s Moment of Thunder. Here are some random photos from last year’s event. . . .